Tyr: …(6. Session, Juli 2011 ) Ich hab eine vergessen oder so, war das die mit dem Sandschiffen? Eine Übersichtskarte der relevanten Orte sowie eine Karte für Reisende. Die Region zwischen Tyr und den Tablelands in der sich die Gruppe das erste Mal in Altaruk begegnet. Der Defender Arik (Mul Fighter) - Alex Z. Der Leader Darok (Mul Shaman) - Alex B.
Ihr könnt im Calendar dann einsehen welche Termine als nächstes Anstehen und wo man sich um wieviel Uhr trifft. The world of the Dark Sun setting is unique in several ways. Many familiar trappings of the Dungeons & Dragons game are missing or turned on their heads. Athas is not a place of shining knights and robed wizards, of deep forests and divine pantheons. To venture over the sands of Athas is to enter a world of savagery and splendor that draws on different traditions of fantasy and storytelling. Simple survival beneath the deep red sun is often its own adventure. 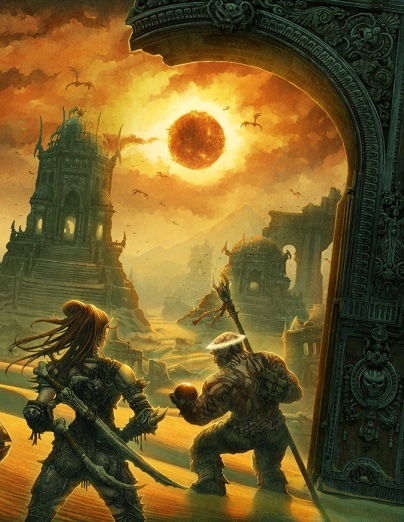 Newcomers to Athas have much to learn about the world, its people, and its monsters, but following eight characteristics encapsulate the most important features of the Dark Sun campaign setting.